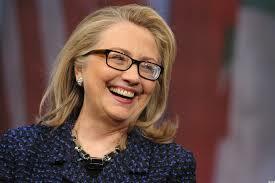 Of course, we don't have a national presidential election. Rather the race for the presidency is decided by 51 separate contests held in the states and the District of Columbia The fight is over the selection of electors in each state, the total of which is equal to the number of Senators and Representatives each state has. (D.C. also has three electors via constitutional amendment.) The Founders didn't trust democracy and thought average people might be too inflamed by the passions of the moment to exercise the best judgment on who should be President. Instead Electors chosen by the people would be the sort of enlightened folks who would exercise the best judgment about which candidate should be President. Very quickly though the Electoral College became a rubber-stamp of the popular vote within the states. The Electoral College never became the deliberative body (each state's delegation was to meet and debate their choice after the popular election) that the Founders expected. 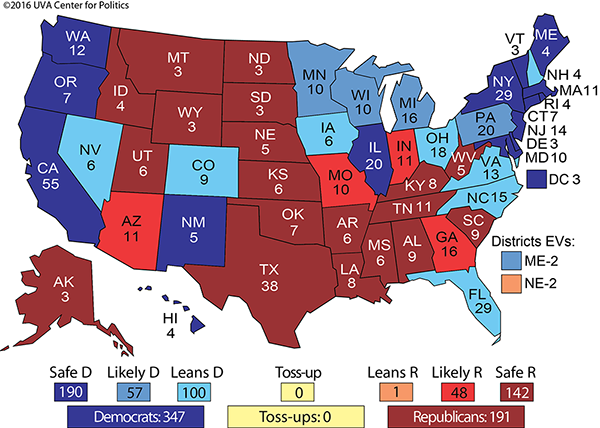 This week Sabato released an updated Electoral College map presuming a Hillary Clinton-Donald Trump matchup. 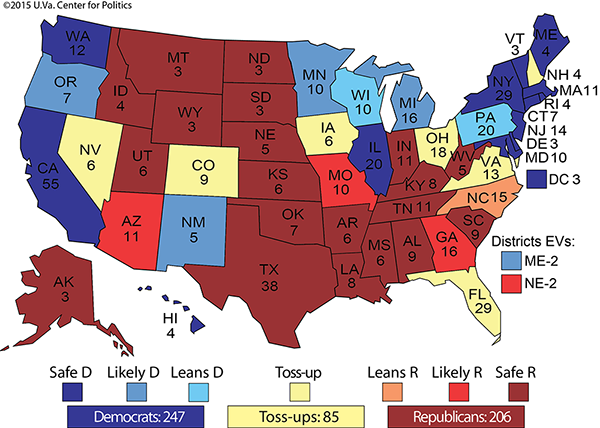 As he did with the May 2015 map, Sabato used each state’s electoral history, developing demographics, and current polling data to make his projection. The result shows that Clinton would beat Trump in an Electoral College landslide. The events of these past two weeks might well signify the beginning of the end of Donald Trump as GOP nominee. He's likely to lose Wisconsin, perhaps badly,and other states such as Indiana, leaving the New York businessman short of the 1237 delegates he needs for the nomination. If Trump is short on the first ballot, he is very unlikely to make up the difference on the second ballot as many of the delegates obligated to vote for Trump on the first ballot due to his winning their states' contests are not actual Trump supporters. I also do not think it is a given that second place Cruz then wins the nomination on the second ballot though. The nomination could be thrown open to a complete outsider. I've long argued that former Texas Governor Rick Perry, a staunch conservative with a record of accomplishment would have been the best nominee Perry, is certainly never been considered pro-Establishment and he could have bridged the gap between the two camps. 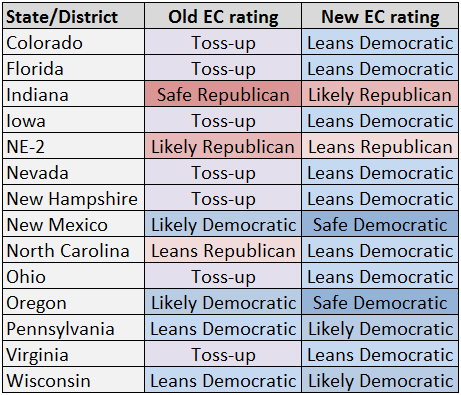 Regardless, it appears that a Trump nomination might not only hand the White House to the Democrats...again, but it might be so lopsided that it gives the Democrats control of the Senate and House. That makes it imperative at the very least that the Republicans put an acceptable candidate at the top of the ticket. To give you an idea, Paul, both my wife & I -- GOP loyalists who've been PC, VPC & candidates for office -- will vote Libertarian for POTUS if Trump is the Republican nominee. I hear you. I have in my family Republicans and Democrats, conservatives and liberals. They are pretty much all united in fervently opposing Donald Trump and will never vote for him under any circumstance. Let's face it, the national Republican brand is dead. When Rick Perry becomes the Party's intellectual it's past time to bail. Anon 1:08, not sure I understand the shot at Perry who dropped out months ago. Plus, Rick Perry is a bright guy. The leading GOP candidate Donald "I have a big brain" Donald Trump, however, clearly is not. Maybe you should mock him instead? well. it appears everyone is a little too confident in their analysis now.